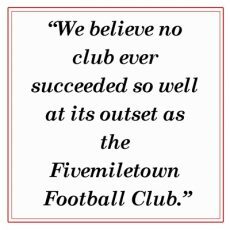 Football in Fivemiletown has been quiet for a few years, but as we enter the new decade interest started to pick up again. But football, not only in Fivemiletown but right across Europe and the world, will soon have to take a back seat to more pressing matters. Over 1300 miles away in Sarajevo, Bosnia, on the 28th June 1914, a Serbian nationalist assassinated the heir to the Austro-Hungarian Empire, Archduke Franz Ferdinand and his wife. One month later on the 28th July 1914, Austria declared war on Serbia, and things soon escalated, with Russia taking the Serbian side and Germany taking the side of Austria. By the 4th August, Britain, France, Belgium and several other countries had entered the war and over the coming months more and more countries got pulled into the conflict. Young men from all across Ireland volunteered and an awful lot of them never came back. 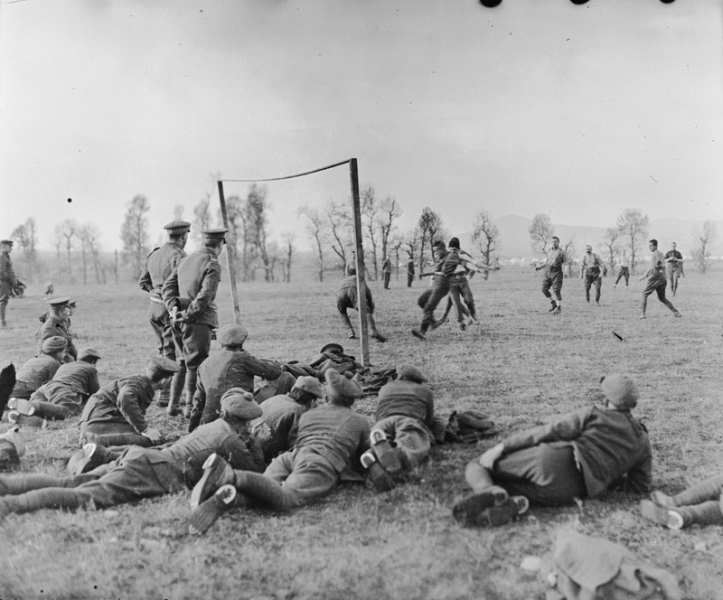 Football was widely used as a tool for recruiting men for the forces. Posters were also produced which appealed directly to supporters of specific clubs. 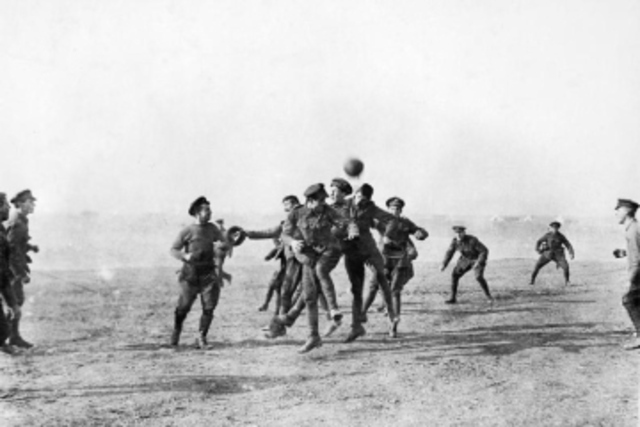 The most famous football match played during these troubled years took place in 1914 during the first Christmas of the war. By mutual consent, an estimated 100,000 British and German troops along the Western Front declared a truce, and those near to Armentieres in France sang Christmas carols before leaving their respective trenches to play a football match in sub-zero temperatures in no man's land. Before the match - between the 2nd Battalion The Royal Welch Fusiliers and the Saxons of 133 Infantry Regiment and the Prussians of 6 Jäger Battalion gifts were exchanged - the Germans giving two barrels of beer and the British a plum pudding. The Germans won - differing reports give the score as 2-1 or 3-2 - and the following day hostilities resumed, again by mutual consent. Kurt Zehmisch was a German lieutenant in the First World War. 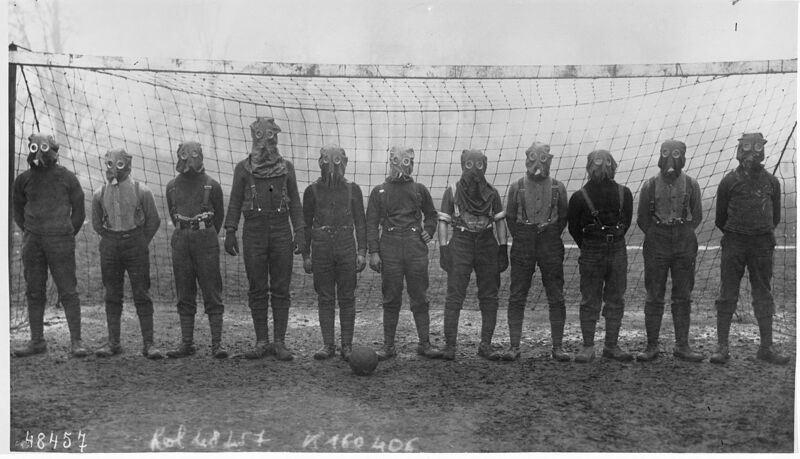 "A couple of Britons brought a ball along from their trenches, and a lively game began. How fantastically wonderful and strange. The English officers experienced it like that too -- that thanks to soccer and Christmas, the feast of love, deadly enemies briefly came together as friends." "It was just a general kick about. I should think there were about a couple of hundred taking part ... I was pretty good then, at 19 ... There was no sort of ill-will between us. ... It was simply a melee -- nothing like the soccer you see on television. The boots we wore were a menace -- those great big boots we had on -- and in those days the balls were made of leather and they soon got very soggy." Football in ‘no man's land’ between opposing forces was strictly forbidden for the remainder of the war. But football was still played behind the lines. This photograph shows officers versus other ranks football match being played by members of the 26th Divisional Ammunition Train near the city of Salonika on Christmas Day 1915. 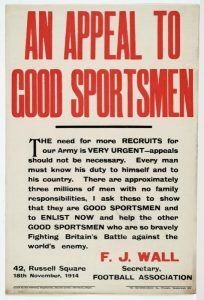 Sports such as football were seen as a good way for officers to develop leadership skills and to forge links with their men. Even with the threat of a horrific attack from gas football was still played. Local Football still went ahead during these years, although the league itself was suspended, I have been reliably informed cup games went ahead, I have no evidence of this at the moment but will update this section as details become available. 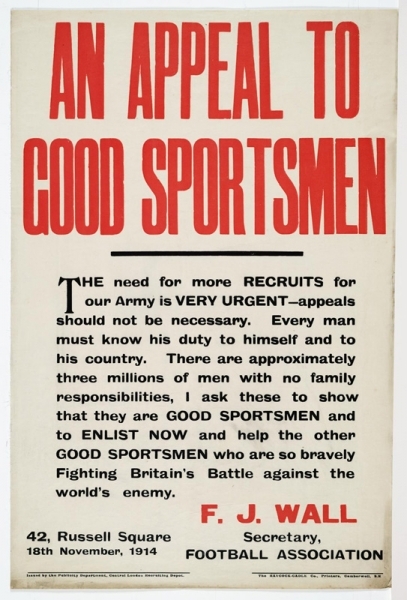 Putting together a couple of football teams, needing 22 men, was almost impossible in the later years of the war, when the British government passed the Military Service Act in 1916. The act specified that single men aged 18 to 40 years old were liable to be called up for military service unless they were widowed with children or ministers of a religion. Football in Fivemiletown will have to wait a few years yet before it gets back to normal. How did Fivemiletown Football fair?